The first of its kind of a one of a kind girl! Olivia is a six-year-old kindergartener who has been using a motorized wheelchair since she was a toddler. The problem with her power chair is that it isn’t able to navigate stairs or even the simplest step into someone’s house. 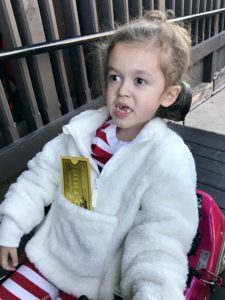 That means that if Olivia wants to go into a friends house to play or for a birthday party, she has to rely on her parents lifting her in a manual wheelchair. Once inside, she can’t navigate as well. There is a device that converts a manual wheelchair into a temporary power chair. Lightweight and portable, it would allow Olivia greater Social inclusion and help her transport her more easily. This product is made in Canada and Olivia’s will be the first in the United States! Another first from Variety KC – and just the start of so many new adventures for Olivia! Help us to help other kiddos like Olivia, donate today!